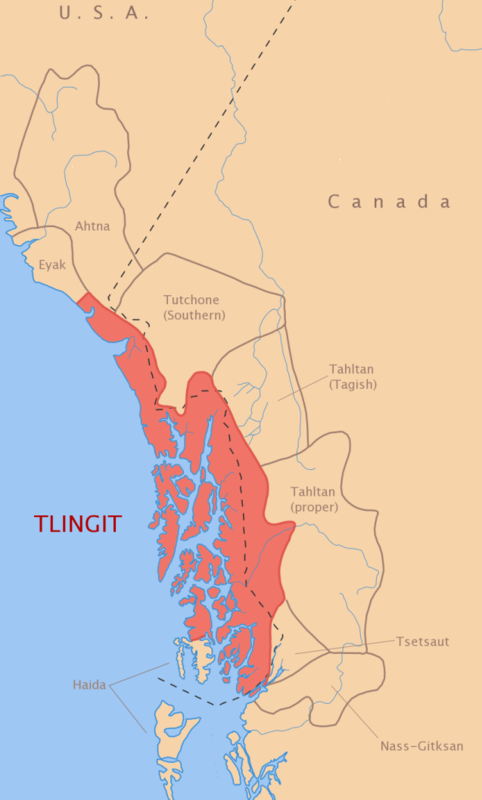 The Tlingit (特里吉特人) are one of the Native American people that live along the southern coastal region of Alaska and western Canada. They have long enjoyed a reputation for being skilled traders and competent warriors. They have strikingly beautiful homes, carve large and imposing totem poles, and wear highly decorated ceremonial clothing made of bird feathers and animal pelts. One of the most fascinating cultural traits resulting from their particular set of circumstances is that Tlingit warriors have historically worn into battle body armor made of animal skins covered with old Chinese coins. The Tlingit believed that these old Chinese coins, made of bronze or brass and having a square hole in the middle, would provide protection from knives and bullets when fighting territorial wars against other tribes or the Russians. Some of these historic garbs, such as the one pictured above, are now in collections of such major museums as the American Museum of Natural History in New York. 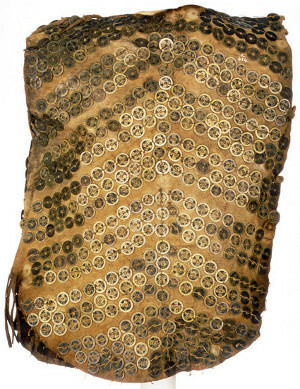 As can be seen, this moose-hide garment is covered with many old Chinese “cash” coins sewn on with sinew. Sometimes the coins would be in chevron patterns on the chest as shown on the garment at the left. Some warrior garments are completely covered with overlapping coins. The Tlingit believed that the coins would provide protection from bullets. There is some anecdotal evidence that such body armor was in fact effective in a battle with the Russians in the year 1792. According to Russian historical accounts, “bullets were useless against the Tlingit armor”. Of course, it may have been that the armor was more effective in terms of psychological warfare then in actually providing protection from bullets. Russian smoothbore muskets at the time were notorious for being unreliable and inaccurate. Besides used as armor on warriors clothing, the ancient Chinese coins were also used as decorations on Tlingit ceremonial robes and masks. 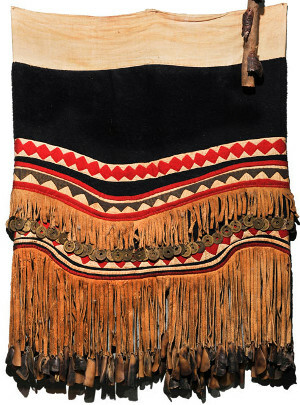 Chinese coins can be seen hanging from the top row fringe on the Gitxsan dancing cape shown at the left. The coins made noise whenever the wearer moved. The Chinese coins were believed to symbolize wealth from a great power in a foreign land and as such enhanced the prestige of the owner by providing proof of his success in trade. 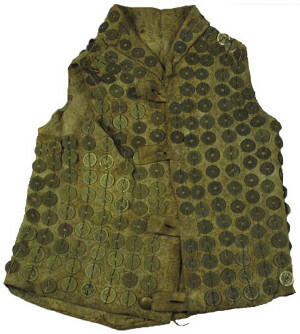 The Tlingit body armor and ceremonial robes tended to use coins only from China’s Qing Dynasty (1644-1911). In particular, coins cast during the reigns of the Shunzhi Emperor (顺治帝 1643-1661), the Kangxi Emperor (康熙帝 1661-1722), and the Yongzheng Emperor (雍正帝 1722-1735) were preferred because these coins tended to be larger and heavier than coins cast during the time of the Xianfeng Emperor (咸丰帝 1850-1861) and later emperors. Most of the warrior garments in museum collections have coins with the inscription kangxi tongbao (康熙通宝) dating from the reign of the Kangxi Emperor. The coins used to make the warrior and ceremonial garments were obtained from maritime merchants who traded the coins for Tlingit animal skins which they then exchanged with the Chinese for tea, silk and porcelain. Old Chinese coins have historically been used for a number of purposes other than currency. The Chinese used them as good luck charms, ground them up for use in traditional Chinese medicine, and used them to predict the future. The Tlingit, an indigenous people living on another continent, discovered yet another use for these coins as body armor. For additional information on ancient Chinese coins, the Tlingit and their body armor, trade between the Russians and the Tlingit, and possible evidence of a controversial theory regarding worldwide exploration by early Chinese explorers, please see an article published by Discovery News entitled “Ancient Chinese Coin Brought Good Luck in Yukon“. I am honored to have been interviewed for the Discovery News article because I had the rare opportunity to be the person the Canadian archaeologists contacted to identify the old Ming and Qing dynasty coins unearthed at the pre-gold rush site in the Yukon.